Jeremy was invited to the state, to sample the famous powder sought by Skiers. Jeremy went to Summit County, Colorado visiting the famous resorts of Keystone, Breckinridge, and A-Basin. He found a lot more to do than hit the slopes. Getting to Colorado is much easier now as more airlines offer direct flights into the states’ capital, Denver. From there you can rent a car or take a shuttle bus into Frisco, the heart of Summit County. I-70 Interstate so it is easily accessible, a 90 minutes drive from the airport. Turn off the I-70 at Silverthorne, the gateway to the ski resorts. A town growing in size and providing all types of shops to support your holiday. In Silverthorne, you will find high-end outlets with huge discounts, on clothing, watches, trainers and all manner of goods. This town has many top motels offering rooms at $150 a night, but the owners will do deals for longer stays. For higher quality accommodation seek out your own chalet or apartment in the main resorts. A lot have concierge service, with gym, pools and hot tubs. They are located close to the ski slopes, so you don’t have to drive to the resort each day. If you do need to travel you can use the excellent free bus service, which runs all day. The location of the most exclusive chalets and apartments allow for skiing directly to the door. The prices can be upwards of $3000 a week but some can accommodate ten people, so the costs could be spread out. I have put together a short list of top class accommodation, skiing, and dining. These places are the best of many available in the Summit County area. Crystal Peak Lodge is in the alpine paradise of Breckenridge. It combines modern luxury, with a rustic mountain setting to provide you with the ultimate Colorado ski destination. Nestled at the base of Breckenridge Mountain, The Lodge offers guests amazing views of the majestic Colorado Rockies and convenient ski-in/ski-out access to the world-class ski trails of Breckenridge Ski Resort. After a fun-filled day on the ski slopes, grab a short ride on Crystal Peak's shuttle to Main St. and enjoy an array of gourmet restaurants and shopping. Stay in, relax and rejuvenate in Crystal Peak’s outdoor hot tubs. Mountain Thunder Lodge features cosmopolitan luxury, in a rustic mountain setting. As one of Breckenridge's ski-in / gondola-out properties, this gem of luxury, offers convenience and personal service. The Lodge is just two blocks to historic Main Street, easily accessed by foot. The lodge is also a short walk to the Gondola and offers guest's convenient ski-in access via the Skyway Skiway. When you are ready for a hot tub, ski back, then relax in one of the hot tubs or the outdoor heated pool. Mountain Thunder is beautifully decorated with an elegant but rustic feel. It also features a state-of-the-art fitness centre. Access to the bowling alley, aquatics center, media rooms and billiards table located at One Ski Hill Place, A RockResort. One Ski Hill At the base of Peak 8 in Breckenridge, is a luxurious ski-in, ski-out lodging experience. You will find unmatched service, proximity to the slopes, and direct access to all that Breckenridge is most famous for. The gondola will sweep you down to the charming town of Breckenridge in just minutes. Then return to the modern mountain comfort, high-end finishes and intimate personal touches that make One Ski Hill Place a destination that truly feels like home. Luxury accommodation ranges from studios to four-bedroom condominiums, but each of these guest room options is as richly appointed as the last. Stunning living rooms. Dramatic fireplaces. Large windows. Extravagant details. These luxury guest rooms have got it all. Enjoy the 5 Star amenities of One Ski Hill, private aquatics center, and fitness facility features two indoor swimming pools, two hot tubs, and a fire pit, as well as state-of-the-art fitness equipment, steam room and sauna so you can work out or rest up for a day on the slopes. The private Rejuvenation Centre has treatment options from massage packages to a signature Alive & Ageless facial, aromatherapies, deep-conditioning treatments and more. 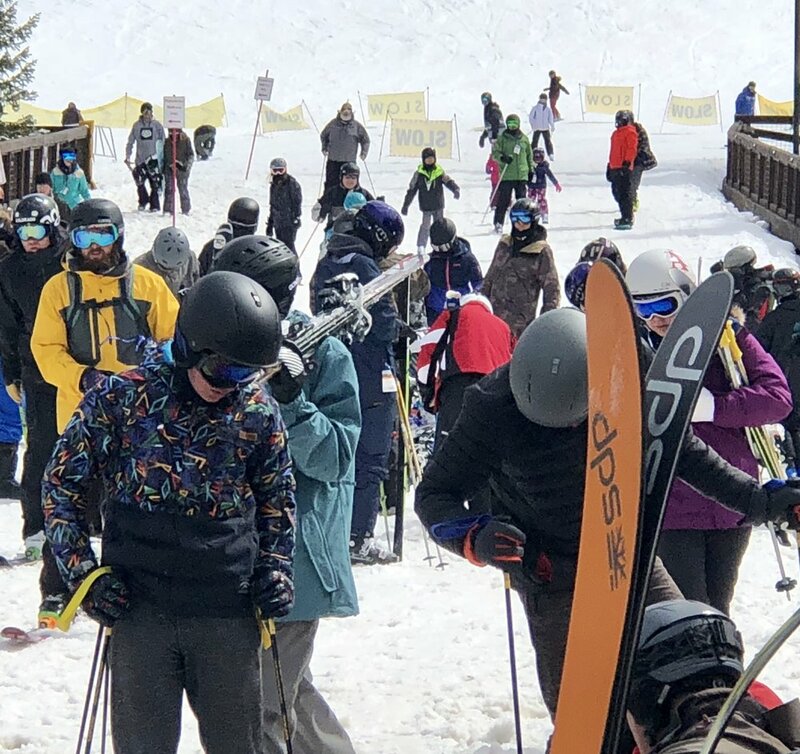 The three main resorts of Summit County are Keystone, Breckinridge, and A-Basin (Arapahoe Basin)and if you are a keen skier you would have heard of them and the famous powder snow that falls on their slopes. Each one has a different “vibe” as they like to say in the resorts. All provide some of the worlds finest skiing on deep powder snow. Summit County gets some of the highest snowfalls in North America, which allows the season here to be longer than anywhere in Europe. Snow depths are measured in feet, not a mere few inches. The ski trails are all superbly signed and maintained, allowing all levels of skier and snowboarder to enjoy their time on the mountains. The best way to ski the three resorts is to purchase the Epic pass in advance of your journey to Colorado. The pass is valid for the whole season and initially seems expensive but when you divide the cost by the number of days you ski, it is superb value. Costs come down to around $38 a day for ten days skiing. 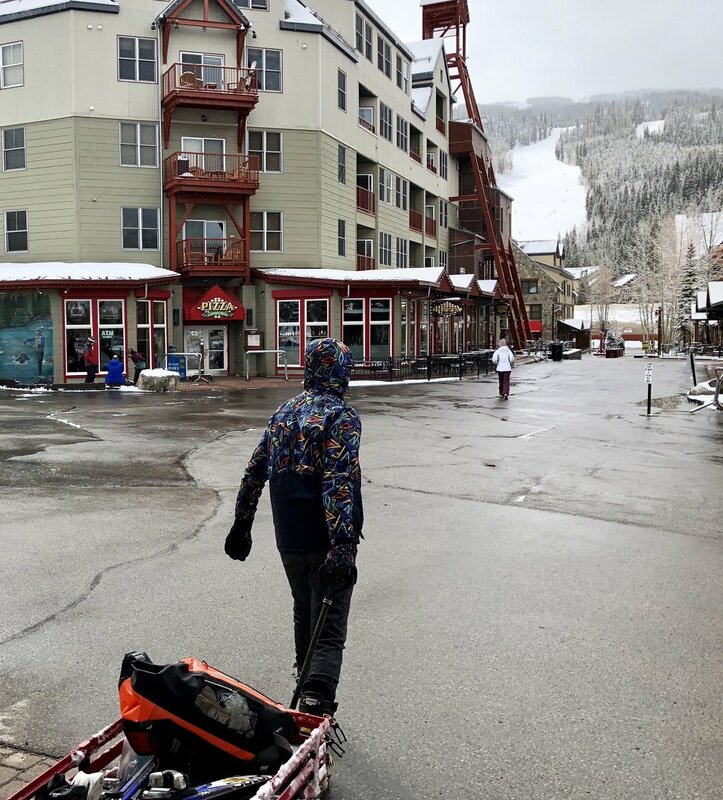 Plenty of rental shops adorn each resort, or take advantage of late-season sales in the shops and purchase your own kit. Prices are low anyway, then they discount up to 70% so bargains are everywhere. Hearthstone Restaurant serves American dishes elevated to give the diner a superb culinary experience. The majority of the ingredients are sourced locally and all within Colorado. Lots of choices on the seasonal menu, and great specials. Try the Trout caught in the Colorado River. Relish is another high-end American restaurant, preparing dishes with their own spin on classics. Fresh seasonal ingredients presented beautifully. Try the slow-cooked beef in beer. Ember caters for people wanting to eat from an international menu. Dishes from around the world created with love, which shows when they come to the table. Peking duck is amazing. The Summit County area offers so much more than skiing, I can only touch on a few of the many activities available. Fat Bike riding has taken off, quickly becoming the trendy activity. A mountain bike with oversized wheels allows you to ride through snow and experience some amazing cycle trails. Hard work but very rewarding when you reach the top of some hills, which expose fantastic views. Snow Shoeing is very popular, modern snowshoes allow far quicker walking as they are lightweight and attach to normal shoes easily. This activity allows you to walk over very deep snow and head off the beaten track. I love to rent a Skidoo and take a guided tour of the area. These are great days, where you head off in the morning and skidoo to a fantastic location. When you arrive you have hot drinks, then tuck into some buffet food. After you are fed and watered you take a different route back to the start point. Great memories. Another memorable activity is taking a Husky sled ride. Help put the leashes on your set of dogs and then choose to sit in the sled or stand with the Musher. Feeling brave you can take control of the dogs, or them the control of you. You will be talking about this for a long long time. Less adventurous, the Breckenridge Health and Rec centre offers a sanctuary to relax in. The outdoor hot tub is lovely especially at night when you can sit in the heat, looking at millions of stars. There is a large indoor hot tub too, with a large heated pool. A flume allows you to plummet into one of the sectioned off areas. The sauna and steam room allow you to completely relax, heating those aching muscles from skiing or the other mentioned activities. Far better than shopping. I loved my time in sunny Summit County, Colorado and would recommend to everyone as the area has so much to offer. World famous Skiing, great dining, fabulous accommodation and many, many activities. Colorado really does captivate. Walk where Whisky was first produced, at Lindores Abbey.